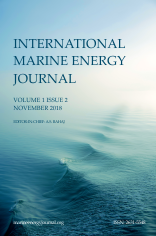 This paper details a hydrodynamic model based on Blade Element Momentum Theory (BEMT) developed to assess ’conventional’ 3-bladed tidal stream turbines (TSTs), adapted here to analyse an ’unconventional’ case of a ducted and open centre device. Validations against a more detailed coupled Reynolds averaged computational fluid dynamics (RANS-BEM) model shows excellent agreement, of within 2% up to the peak power condition, with associated computational times in the order of a few minutes on a single core. The paper demonstrates the application of hydrodynamic forces into a structural analysis tool, in order to assess blade stress distributions of a generic hubless turbine. Incorporation of parameters such as non-uniform inflows and blade weight forces are investigated, with their effects on stress profiles presented. Key findings include: i) the adapted BEMT model replicates the majority of turbine performance characteristics estimated through previous CFD assessments; ii) the proposed model reduces the computational effort by several orders of magnitude compared to the reference coupled CFD, making it suitable for engineering assessments iii) blade stress distribution profiles are quantified, detailing concentration zones and cyclic values for use in fatigue analyses. This work forms part of a greater project aimed to develop a suite of analytical tools to perform engineering assessments of bi-directional ducted TSTs.